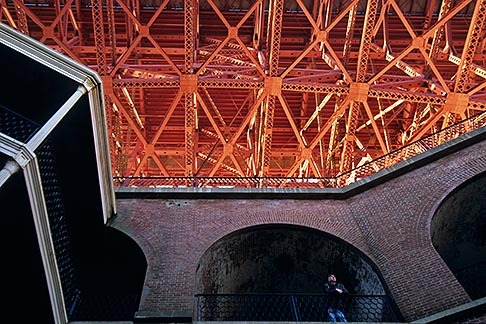 Directly underneath the landmark Golden Gate Bridge, hidden from the view of the steady stream of daily commuters and tourists, lies a surprising and secret treasure – a Civil War era brick and mortar fort built to protect the San Francisco Bay from unknown invaders, and now an unlikely tourist attraction. The contrast is startling. The massive four-storey masonry walls of Fort Point, a National Historic Site, enclose a damp and austere stone courtyard where Civil War soldiers once stood guard. Overhead the international red girders and trusses of the bridge undercarriage convey the constant roar of traffic. Old and new. Brick and steel. Yesterday and today. I’d heard there are restrictions on the use of tripods within the park. Is this true? makes life hard for us LF guys. Cool shot David! I was just there and took a shot from above. I also took some shots of dolphins in the bay, very cool. I love SF! A very neat take on this site. The juxtaposition of steel and brick is a nice one. This is definitely a fun place to explore.